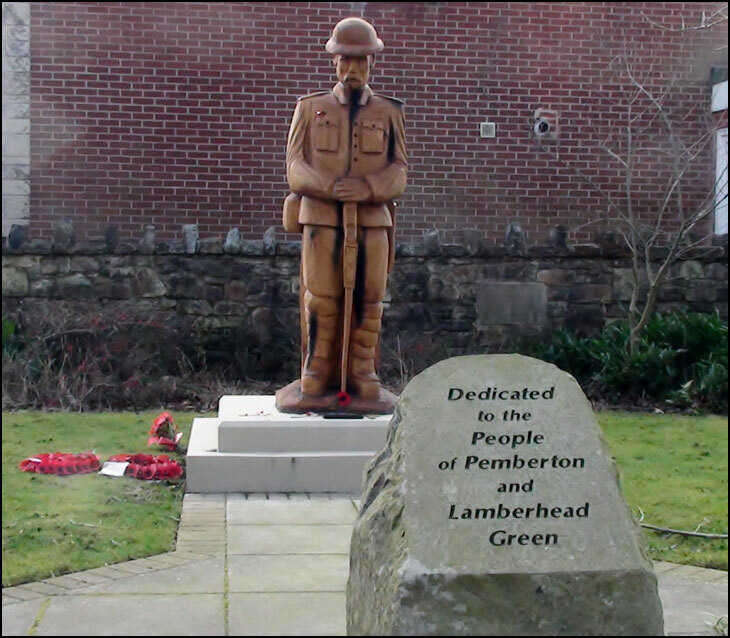 Pemberton and Lamberhead Green War Memorial. What has Pemberton and Lamberhead Green Done to deserve that monstrosity, it is the worst sculpture I have ever seen. Derek theres a lot of these wooden sculptures appearing in other places, Ive seen them in Coppull and Chorley as well. What an awful statue dedicated to those brave soldiers! Who designed it? I'm just back from Rome and seen better in the public toilets!!! Pemberton, Kath. Oh no, Giovanni's back!!! Well, for one I am glad there is now a memorial for the sake of my cousin who gave his precious life to save his friends. I am going to Arnhem again in the next few weeks to take flowers. As children we used to call this area "The Little Park" in which we played. It was in fact a graveyard. There is an old picture here of kids playing. The graveyard used to belong to a church, long gone even when the picture was taken, located over the wall in photo where the house is. Thankfully Garry, Giovanni is back! How was Rome Giovanni? Would you swap it for Wigan? An awful thing to say but I AGREE WITH COMMENTS ON THIS STATUE the surroundings dont look much tidier either,I think it could have looked a lot more dedicated than this. I didn't make any comments earlier bacause i didn't want to seem dissatisfied with the statue, but it does look rediculous. Not worthy of its position. Rome was good....went to the Vatican, Colleseum, Forum, Spanish Steps. Parts of Rome are a dump and they drive like maniacs. The cabbie taking us from the airport nearly crashed!! No tip for him!LOL. But home is where your heart is! That's interesting Giovanni. I would have thought with such a cultural history as Rome , the dump areas you mention would be frowned upon by those who care about it and stopped. You learn something new everyday Always find your comments interesting and amusing by the way Gio. JeanF (Wales) I can't see anything wrong with the surroundings? Grass looks ok. Plants in their Winter state. Poppy wreaths laid at the side. Except for the nightmare of a statue! - It looks fine too me. I agree with you Jeff. Except for the iconic and ancient structures, alot of Rome is run down particularly the residential areas. Graffiti everywhere, uneven paving, faded road markings (abit like Wigan) LOL Seriously, water is allowed to spill into the road from the many drinking fountains in the city and the carabinieri (police) casually smoke on duty! And theres beggars and hawkers in your face (a few Italian expletives soon chased them) LOL. But apart from that a great visit! The Basilica of San Pietro was magnificent! Do go if you get a chance! Are you an Evertonian and do know Eric Weall etc.? Looks like he;s on Safari' and lost his way. He's lost in the Plantations at Haigh Hall! Wiganer, born and bred, Giovanni. A shocking gesture from New Labour council. How dare they remember these brave men in carved wood!